TMB Model Train Club, Lionel Ambassador and home to 81 members is located in Famingdale, NY. The TMB Model Train Club currently houses a 4000 square foot permanent layout in Farmingdale, NY. They also have a modular layout that is taken to street fairs, nursing homes and veteran’s hospitals – promoting the hobby and making people smile. TMB is also the owners of the original Lionel Soprano Layout that was featured on HBO. Through promotion of their club and the hobby, they distribute 4,000 flyers annually and receive 5,000-7,000 visits at their open house events. One of the most popular events the club represents at is the Bellmore Street Fair which attracts 70,000-100,000 visitors. 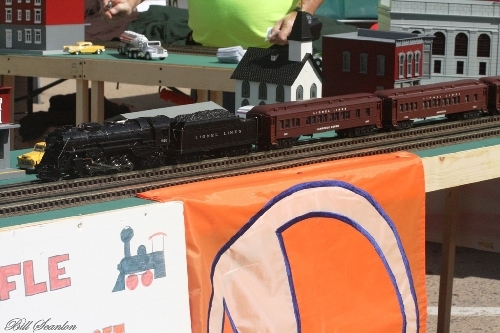 On Sept 17-18 the TMB Model Train Club took our modular layout to the Bellmore Street fair. Attendance was down a bit from last year but approx. 50,000 attended and a lot of guests passed our display. At the event we raffled off a train set donated by Nassau Hobby. The TMB Model Train Club, located at Farmingdale Long Island, NY, recently transitioned to a new location. At this point in time we have completed our bench and track work, wiring and are now in the scenery phase of development. Our basic conventional operation is tied to two control panels which allows for dual operators on each of our main lines. The control panels, although somewhat basic can be intimidating to many of our members. With the membership accumulating many of the new Lionel Legacy engines, we knew it was time to install Lionel Legacy. Overall, the process of setting up and operating an engine in Lionel Legacy is well guided, intuitive, and simple. Legacy unlocks the all the features in some pretty amazing trains and what I covered here are the basics of Legacy. Included with your Legacy system is a full manual which will help you go beyond the basics and unleash the full power of your railroad. If you been in the O-Gauge hobby for a while the CAB-1L/Base-1L system (6-37147) may look very familiar to you. It looks very similar to the TMCC system Lionel released more than 20 years ago. The exterior cases for the CAB-1L and the Base-1L look to be identical to the original system components with a few notable exceptions. The new system has no antenna and the CAB-1L and Base-1L are blue in color as opposed to dark grey/black of the older Trainmaster system 6-12969. Move around, you are no longer tied to the transformer. The communication between the CAB-1L and the base had no issues in the clubs 4,000 sq. ft. train room. View a video of the CAB-1L test session. If you are interested in seeing Lionel's Legacy system in action check it out live at one of our 2016/17 open house events. Model Railroading has many facets to the hobby, and its participants fall into various categories, notably Operator vs. Collector. Another way to distinguish the hobbyists is Purist vs. Realist. The Purist will maintain their train collection in pristine condition and displayed in new toy-like condition. The Realist, on the other hand, has opted for a weathered look. The trains reflect the elements they are exposed to as they do the hard work they are built for. Faded lettering, mud, dirt, dust, and rust are just a few of the daily issues all engines face on the tracks. About the artist - Lionel’s weathered engines are done by hand in the USA by veteran train enthusiast, artist and expert modeler Harry Hieke, who brings over 20 years of experience and personally details and weathers each locomotive. Harry offers a weathering service and is available to weather any engine or rolling stock in your fleet, in addition to his Lionel obligations. Harry also maintains a full line of buildings, all delivered with a realistic weathered look and all modeled after real railroad buildings. Performance aside, it’s the look I went for. The weathering is airbrushed and sealed with an additional dull finish. I opt to run my engines with the smoke units on. As neat as I try to be, some of the oil, either spilled by me or residual grime from the smoke when wiped off, did NOT affect the weathering colors. The colors are spot on and in doing some online research, Lionel’s artist has truly captured the real world weathered look. Lionel is again offering weathering as an option in its Built-to-Order product line. In the 2016 volume-2 catalog, pages 8-9, is a Norfolk and Western Y6B, delivered fully weathered by Harry Hieke. If you are considering adding some realistic trains to your fleet, the new Y6B, Lionel product 6-84063 is the way to go. If you have some existing trains you would like weathered, contact Harry Hieke and have Lionel’s commissioned artist work for you too. As a purchaser of a Lionel weathered engine and having had Harry Hieke weather several engines and cars in my railroad fleet, I highly endorse both Lionel and Harry as products and services you will be pleased with. **The information about the clubs is provided by them and may or may not be accurate depending on changes in membership, 501c status, etc.. Lionel is sharing their content and not validating it’s accuracy.